Hello! 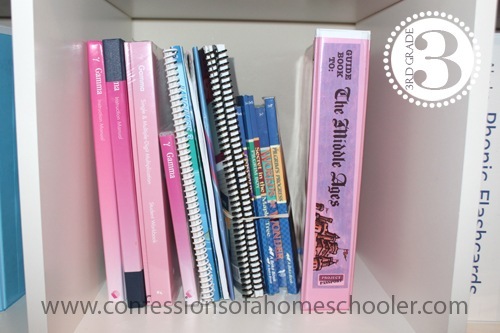 Today I’m sharing Tinker Bell’s 3rd grade homeschool schedule with you. Tinker Bell turned 9 in February and is doing great this year. Here is a sample of her schedule. She often works through her assignments faster than what I scheduled. But I don’t want to over-fill her day, so I still spread it out like this so that she has plenty of time. 4:00pm – Swimming & Inline Hockey…Yes, she plays hockey and she’s great at it! Mama was a little nervous, but this girl can hold her own! Here are our curriculum choices for 3rd grade this year. Daily Learning Notebook: She’ll be doing the Cursive Notebook this year. Science: Abeka Science 5 (We do this as a group) & one of my scientist units if we can fit it in! Robotics: LEGO Education We’re continuing with our co-op group and the Simple Mechanisms set this year. LEGO Education We’re continuing with our co-op group and the Simple Mechanisms set this year. 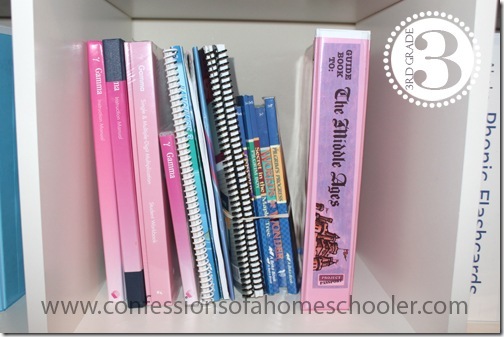 If you’ve missed my previous posts for our other grades this year, you can see my ‘Daily Homeschool Schedule’ series here. What writing resource do you use in 3rd grade? I am thinking about purchasing Write Source for my daughter who will be in 3rd grade this fall. Curious as to your thoughts about writing at this grade level? She did the IEW with my older kiddos, and she did great! I think it depends a little bit on your 3rd grader, but I really do like how they teach writing in IEW. And it sounds more intimidating then it is. My son will be at 3rd grade level next fall. I just peeked at the IEW website (I’ve not heard of it before). I see different options/packages. Can you tell me what all you ordered and used, and what you found most useful and valuable? Did you only order workbooks? DVD? Thank you! We started with Student Writing Intensive Level A, this year we’ve moved on to Continuation Level A.
I am thinking about homeschooling in the future. My daughter is 15 months, but I am wondering how it would look like. For example, how do you teach kids from different grade levels? When do you have time to plan out different lessons for different grades and for different subjects. I am a third grade teacher, but teaching at home sounds intimidating for some reason, but I would love to do it. You’ll want to check with your state to see what the daily requirements are. Each state can vary. http://www.hslda.org is a good place to start. can you tell me alittle bit about vocab workshop for your 3rd grader? How do you know which series and color to choose? sorry If there are any typos……I’m holding a newborn in my right arm and typing with my left lol.Have a great day. How did you find Sadlier products? I checked out your link and their products are very impressive. it is nice to learn about other resources available on the market. Do these workbooks come with a teacher’s guide? Yes, the teacher’s editions are usually at the very bottom of the product page for each level. I didn’t get a TM, just graded them myself. Oops, I was just informed that you have to have a teacher’s license to get the TM. I apologize for any confusion. I didn’t use it, they’re pretty easy to grade on your own, so I wasn’t aware that they weren’t very homeschool friendly! the co-op group that you all attend is just the lego Education? I am wondering if there are other things that are taught during the co-op session? This year we just meet for robotics for our co-op. I have done other ones where we do a variety of subjects as well. It really depends on our needs for the year. We also attend a once a week options program where the younger ones do science, art, pe, music, language, spanish and my older one does yearbook/newspaper, creative writing, computers, and speech/debate. You have no idea how much your website has helped me, thank you thank you! I could have sworn I saw that you used Spelling you see this year. Can you give me advice on spelling you see vs. all about spelling for the following grades : K, 1st and 3rd? Thank you again and I cant wait to take advantage of your discount. Hi Danielle, thanks so much I’m always blessed to hear how God uses my blog to encourage others 🙂 As far as AAS/SYS…I like to use AAS Level 1 & 2 as they cover the phonics rules quite well in my opinion. After my kiddos were a bit older, I felt like it wasn’t helping them as much, though the lessons are still quite thorough. I tried SYS this last year with my 5th and 6th graders and it seemed to work quite well. It’s mostly a copy work / dictation type curriculum so we also used it as their handwriting as well. And I think just the constant repetition of writing really did help them memorize the phonics patterns. So if you have K, 1st, I would probably suggest AAS L1 for your 1st and maybe 3rd grader if they haven’t learned the basic phonics rules yet. Hi Erica, I know this post is a little off topic, but I wanted to get your take on it anyway. First off, I love love your blog. I’m planning to HS in the fall (well some summer work as well) and I’ve gotten great info from you. My question is, I thought I saw you mention the “all about reading” program as well as the “all about spelling”. My son currently in 1st grade is struggling with reading and I was planning on starting AAR over the summer with him. His spelling is really suffering as well, and he’s now guessing at spelling words. Do you recommend using both programs at the same time, or staggering it, as the web site suggests, AAR1 and then AAS1? Or since you are using AAS, do you think just that program would help him with the reading and spelling? I’d love you opinion on this. Thank you for this website! It has been a blessing for us! I see you’re doing All about spelling levels 2 and 3, how is that going? I was thinking about doing two levels at the same time too. I didn’t do them at the same time, but knew we would finish level 2 and then start level 3 in the same year. Sorry for the confusion! I wouldn’t recommend doing two levels at one time. I was wondering have you ever heard of Classical Conversations by Leigh Bortins? If so what are your thoughts? Thank you so very much for all your schedules, curriculum choices, menus, etc. I have a question: as to your once-a-week program, how do you get everything done in 4 days and fit in program? I am planning to start a once-a-week coop as well that will take the morning on friday’s. So, just trying to reschedule my year to 4-day weeks. It depends on the curriculum and how many lessons they include. For example Abeka includes 170 lessons, so I have to make a decision on which things to cut out, or skip. For MUS I usually have them do 4 worksheets, then on the 4th day they also do a test, so they’re doing 2 sheets in one day. It’s worked well for us. So I guess my answer is that I just try to schedule the curriculum in a way that works for us. Whether it’s skipping some things, or doubling up one day. I notice that in your schedule there is no slot for chores/daily jobs etc. How do you fit this in with the full schedule? I have been trying to get the kids to do their daily chores – vacuum/sweep/etc straight after breakfast and also gives me a bit of time to get on top of the house before the day, but I am finding that we quite often dont start our school work till later as sometimes it can take awhile for them to get organised with their job. 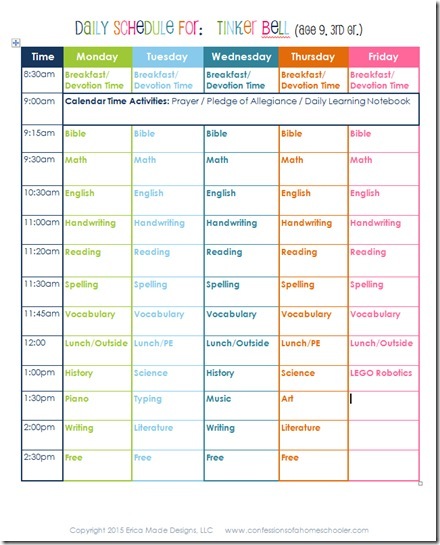 After looking at these daily schedules I feel that we don’t do a lot of school work in the day! How are you able to use Vocabulary Workshop? I just purchased it from the site, and it gives you an online login to use any of their online supplemental activities. Hi Erica. What if you’re little one wasn’t able to finish her assignment/worksheet? Do you have her move on to the next subject and complete it the next day to stay on schedule? I feel that my daughter is overwhelmed on certain subjects and have wondered at having her leave it for the next day, instead of having her complete what’s in front of her regardless if it takes longer. (Which throws off the scheedule for the year) It wasn’t until this year that we’ve hit this road block. I’d love some input.